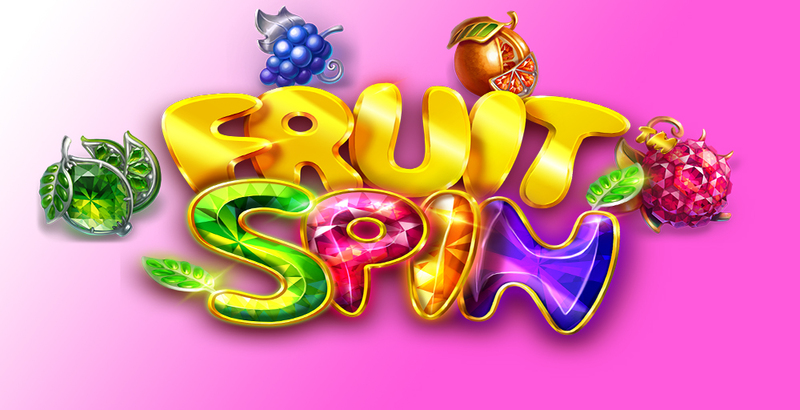 Featuring stacked fruits, bars, and 7s, NetEnt offers Fruit Spin, an incredible video slot, made to reflect crystals. With 5 reels, 40 paylines, and exciting features at your disposal, the game proves to be running quite smoothly with a playful soundtrack as an addition. All in all, it's beautifully packaged with a promise of high-level entertainment, and if you're a fruit fan, give it a spin. Created on the surface in various blue shade triangles, the layout of the game doesn't seem to be that much impressive; however, as the reels start spinning, there is a certain lightness to it. With great rhythm thrown into the mix, visual domain becomes pretty solid. There are oranges, cherries, grapes, strawberries, and limes among the fruits, all washed in their original fruity colors. With a higher value, bronze, silver and gold bars and 7 appear with the latest as the most valuable symbol. A few special editions are also available; a big pink crystal Scatter, and emerald, diamond-looking Wild. As mentioned before, these symbols usually land stacked with great winning potential or in the Scatter and Wild case, 3x3 symbols. 3x3 Scatter symbols come attached and they can land anywhere in the base game, and inside free spins feature. When they appear, 3 lucky wheels will open, and depending on visible Scatter rows, the same number of turns on wheels will be granted. Each wheel has placed free spin symbols, and 20, 40, and 80 coin win symbols. By winning 3 free spins symbols on lucky wheels, 5 free spins are allowed with a possibility to get more on the lucky wheel under the original conditions. 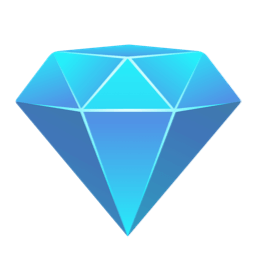 The free spins icon transforms into an extra spin symbol after getting those 3 initial, and each gets one more to your collection. During free spins, lucky wheels bring extra spins, and only 20 coin wins. Apart from new lucky wheel awards, free spins feature has 3x3 Wildcards, and it appears only on 3 middle reels. In this form, it can replace all the symbols but the Scatter. Previously noted, the game entails stacked symbols and not just that; there are 3x3 and 2x2 stacks of all symbols in the main game. 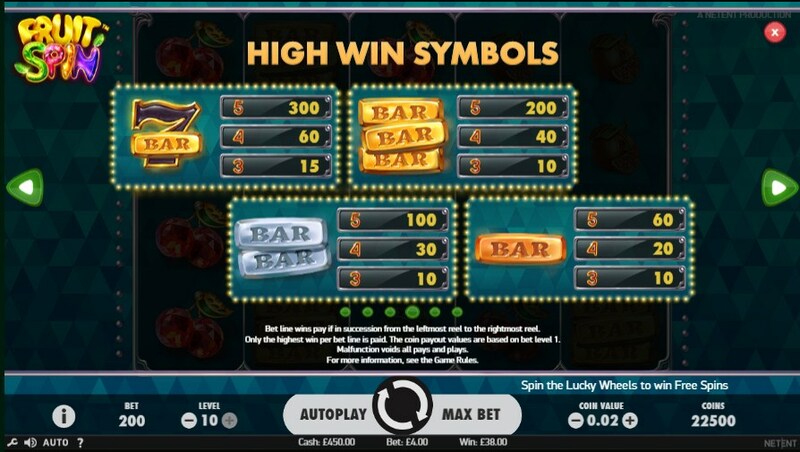 Free Spins have only Scatter, Wild, and high paying symbols 3x3 version form. 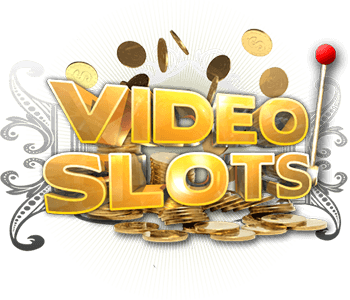 Fruit Spin video slot has nicely made, diamond-like graphics and a few pretty great animations, all accompanied by easy-going sound. Even though visual experience has no extraordinary elements, it's compelling nevertheless. Taking all features into consideration, the game boasts with thought-through pieces. Starting with stacks, lucky wheels, stacked wilds to free spins feature, there's no doubt all of them are made with a great deal of imagination. Being connected in a unique way, there is certain freshness worth of appreciation. 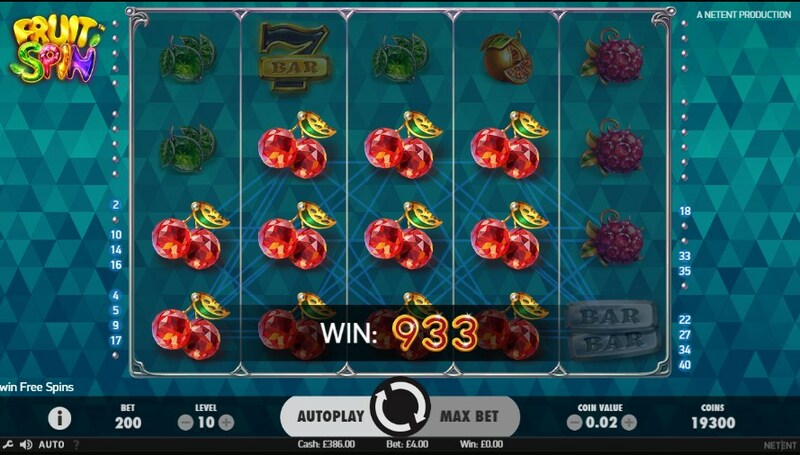 Summing everything, if you like classic fruit slots, then look no further, because Fruit Spin game gives that old-school vibe with a bunch of excellent new features to enjoy.